The Ladysmith Maritime Society is pleased to offer guided tours of the Harbour during summer months in our restored lifeboat, Maritimer. 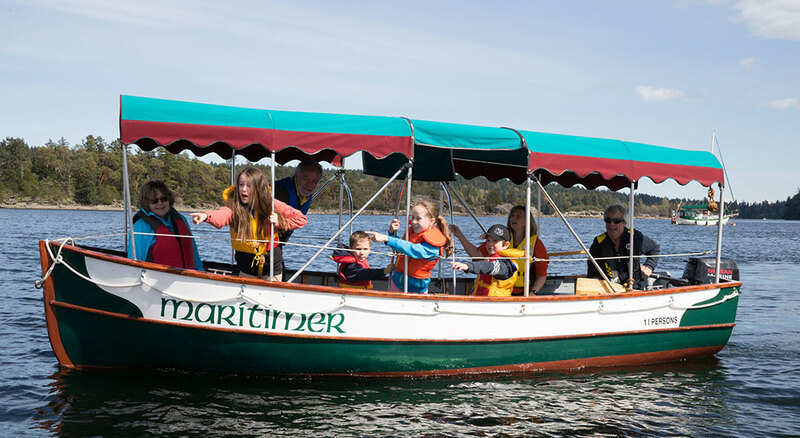 Thousands of people have enjoyed a 90-minute cruise, listening to stories of the local history, viewing eagles, seals, otters, cormorants, starfish, jellyfish and other wildlife along the way. As part of the fun, your skipper will take you to where you can “Cross the Line” … the 49th Parallel that is! Don’t forget to stop in at the Marina Office to purchase a T-shirt to prove it. Maritimer can accommodate up to 10 people and our skippers are Transport Canada-certified. July & August public tours operate Wednesday through Sunday at 10:30 a.m. and 2:00 p.m. Tours are by reservation, on a first-come, first-served basis. If you wish to reserve a spot, call our Marina Office at 250-245-1146. With a minimum of 6 people, you can enjoy a personalized tour on the Maritimer with one of our experienced skippers. These tours are available at times other than the public tour schedule (above). Call 250-245-1146 to reserve your tour. If necessary, leave a message, and a skipper will return your call to confirm. We hope you enjoy your tour!